Being efficient in your backstroke arm pull is all about grabbing onto the water and then pushing it directly behind you. 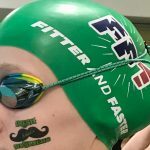 Today we are highlighting a drill from Swim Videos On Demand that most coaches usually don’t like. In this drill, Tyler Clary will teach you focus on a long reach, early catch, and then a powerful finish while swimming backstroke and grabbing onto the lane line with every stroke. The goal in this drill is to grab the lane line buoys and push them straight along the lane line in the direction of your feet. If the lane line dips underwater or moves from side to side, you know that you’re not being as efficient as you could be! Watch this short clip of Tyler Clary demonstrating this drill and notice how his power is sent directly behind him with each stroke.